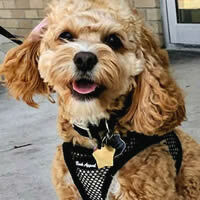 The EZ Wrap Harness is the best no-choke step-in walking harness for your dog because there are no straps that twist when you're trying to put it on! 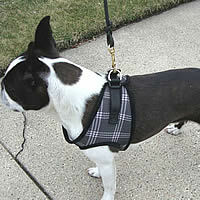 You'll get the EZ Wrap Harness on your dog in just seconds! Available in light breathable net or soft cushiony mesh! 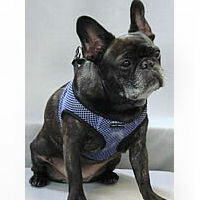 And this harness is perfect for puppies and even 3-legged dogs. 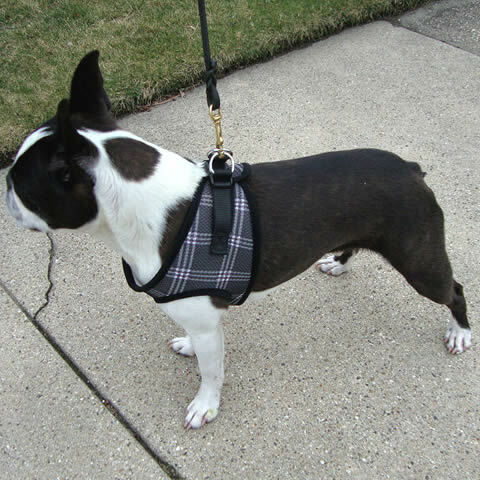 The EZ Wrap Harness by Bark Appeal is an easy, no-choke step-in walking harness for you and your small dog - no straps to adjust or get twisted! You can be out the door in seconds. 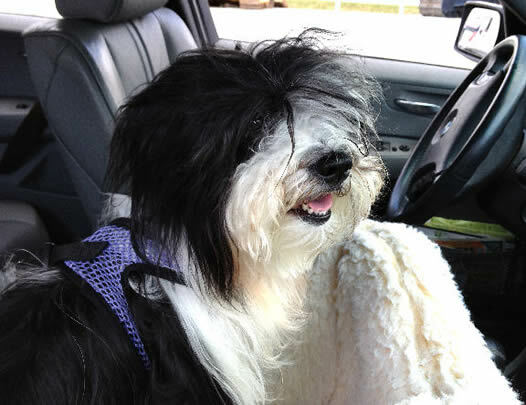 Many dogs find the EZ Wrap more comfortable than other step-in harnesses because it provides a little more chest coverage. 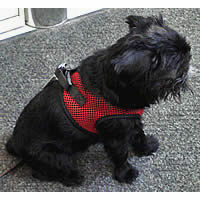 The harness sits below your little dog's neck at the chest so there's no choking risk. 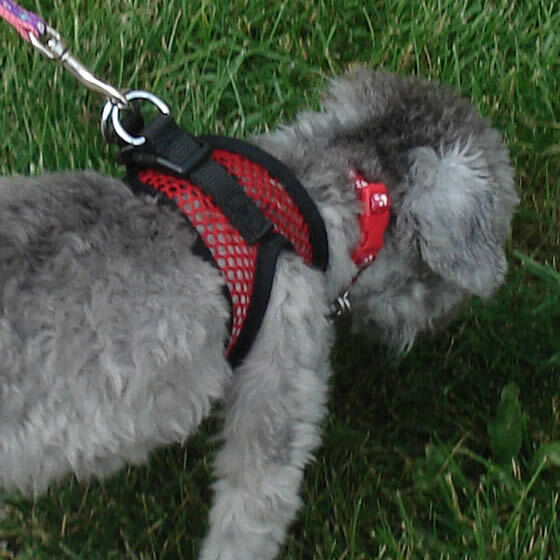 The leash is attached at the shoulder blades. It's one of the best dog-walking harnesses because it is so easy! 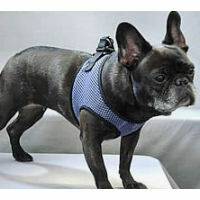 The EZ Wrap Harness is comfortable for your little dog, and simple for you. 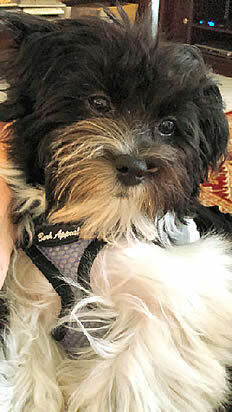 Are you frustrated because your puppy won't let you put her harness on? 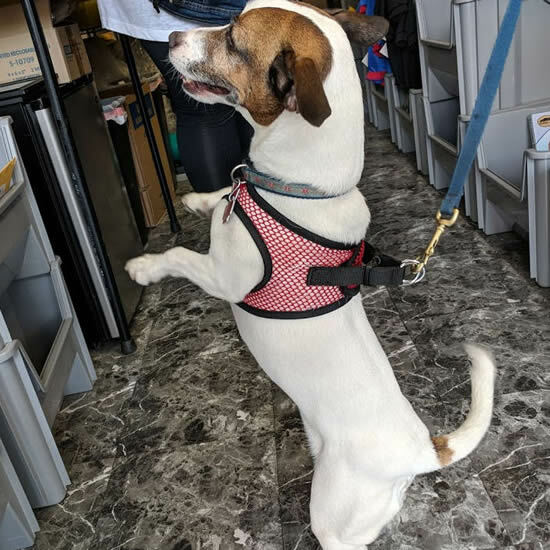 Does she wiggle and twist her little body so that you can't put her legs through the right openings on most harnesses? 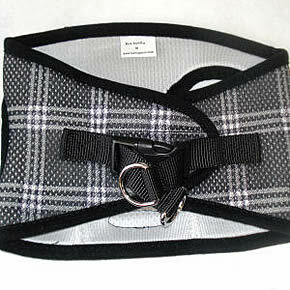 It's simple to put your puppy's legs through the EZ Wrap Harness' oversized arm holes! And there are no straps that tangle! Easy! The EZ Wrap is super-simple to use. 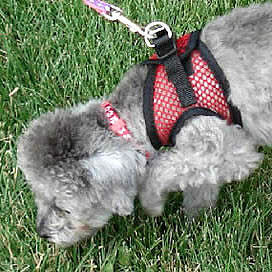 Just 4 steps and your little dog is ready for a walk: 1) put your small dog's front paws into the holes, 2) bring the sides of the harness up, 3) fasten the industrial-strength velcro and 4) pinch the clasp shut. 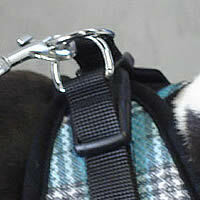 Attach the leash to both D-rings (for triple-redundant safety), and you're ready for a walk! 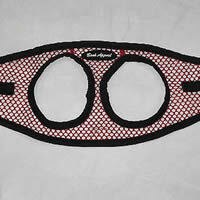 The arm holes are oversized, and are far from the armpits, which reduces matting! 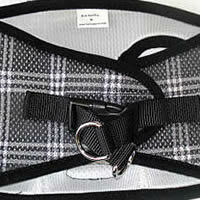 The EZ Wrap Harness is available in two fabrics: light and airy Net and cushiony Mesh. 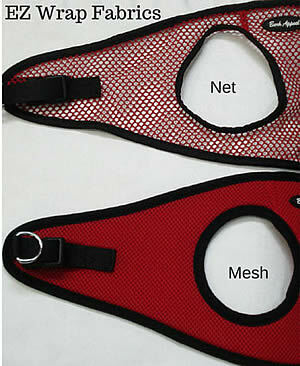 While the body of the net halter is light, and airy, the black trim is strong enough to withstand two adult humans trying to pull the harness apart. (Yes, we tried!) 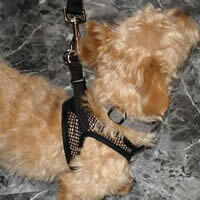 Both the net and the mesh are extremely comfortable for your little dog. The trim is super-soft on each, so there is no discomfort in the armpits. 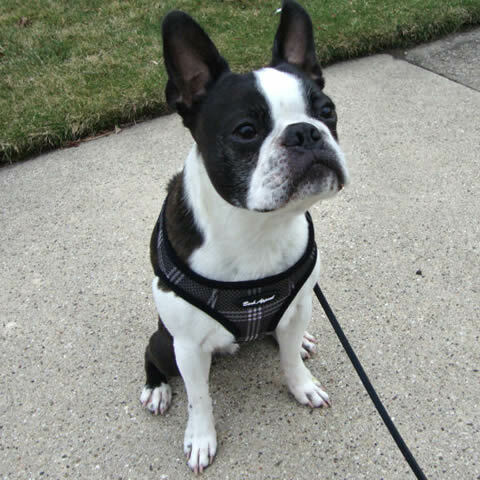 The EZ Wrap Step-in Harness is also available in a Hibiscus print fabric - crisp cotton on the outside and soft mesh on the inside. Here's a diagram showing where to measure for the best fit (opens in a new window). 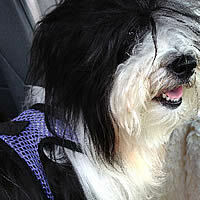 Maddie (Havanese) in Lavender Net in Size Small, is hooked up in her car seat, ready to go. Dax (French Bulldog) is wearing the EZ Wrap Harness in Size Large in Lavender Net and Tango (Brussels Griffon) is wearing the Size Small in Red Net. 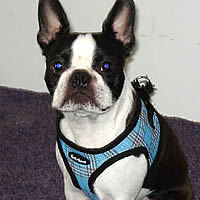 Booker (Boston Terrier) is wearing the Blue Plaid Mesh (above) and the Black Plaid Mesh (in the picture cloud) in Size Medium. 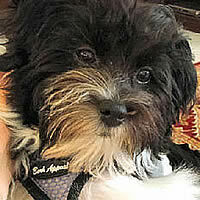 Macie (Havanese puppy) is wearing the Lavender Net in Size X Small. 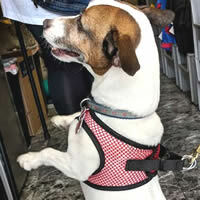 Bear (Dachshund mix) is wearing the Black Net in Size Small. 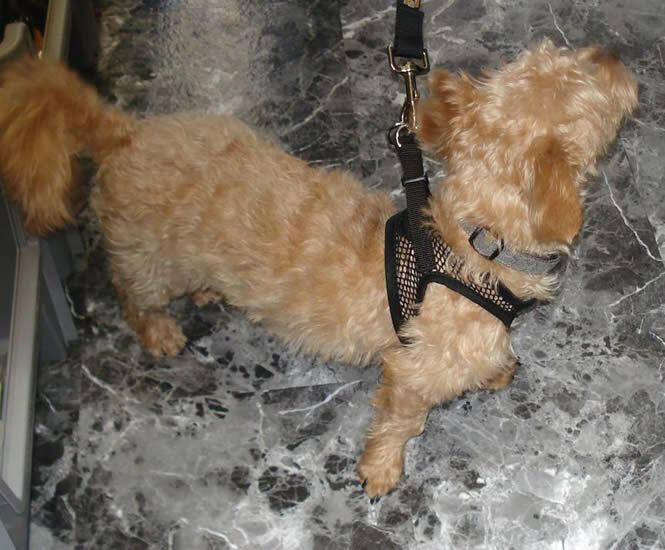 And Louie (Poodle Mix, left) is wearing the Black Net in Size Medium. Best Harness for a 3-Legged Dog! 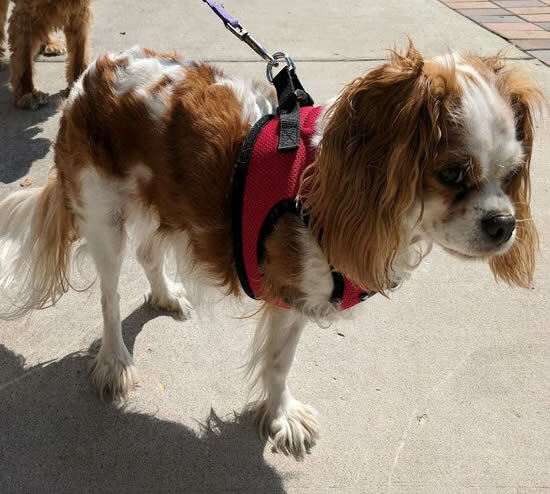 Angel is a Cavalier King Charles Spaniel with only 3 legs. But she doesn't let that stop her! Angel stays comfortable on her walks in her EZ Walk Harness. 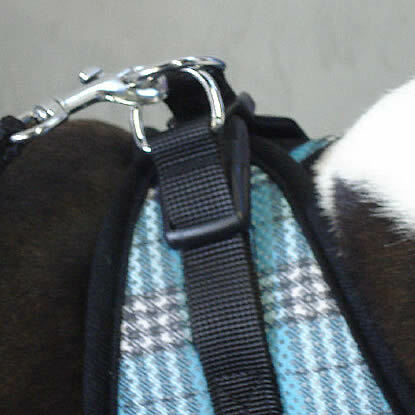 The legs go in their individual holes so, even though one hole is empty, the harness does not shift around and cause matting or chafing! 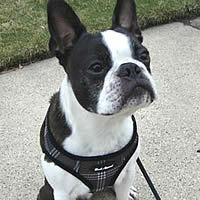 Here's a short video demonstrating how easy the EZ Wrap Harness is to put on a little dog. 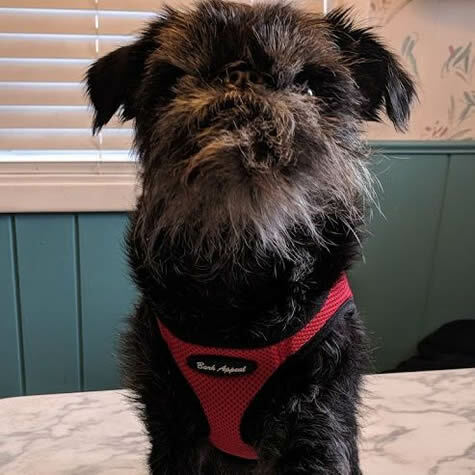 Here's Fran and Tango the Brussels Griffon! Please note: we receive shipments from the manufacturer every week, so we maintain complete online availability. If we don't have the exact size, color and fabric you want right now, it's coming soon and we'll let you know. 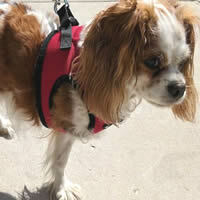 "Madison will be 7 this March and the only harnesses that we have used is the EZ Wrap from Golly Gear. 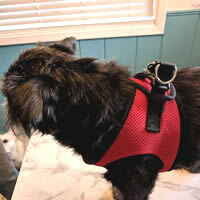 Best and easiest harness to use! I highly recommend them and Golly Gear!" 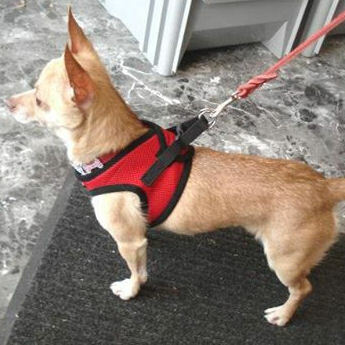 "Best harness for our two chihuahuas!"